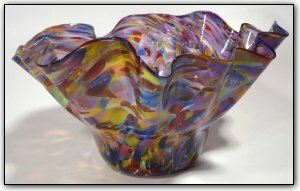 This fluted bowl is from the End Of Day® series, meaning it is made with a variety of colors used throughout the day, and contains nearly every color in the rainbow on the exterior. The interior also features end of day colors along with enhanced tones of purples. And this fluted bowl also has walls that are relatively thin and very elegant, allowing for an abundance of flutes with absolutely stunning form.